Samba in Rio | Fully customized itineraries to Europe, Central and South America. Your tour, your way. Discovered by Portuguese navigators in 1565, Rio de Janeiro has since been famous for its laid back beach culture and annual Carnival celebration. Spend 6 nights along the bustling beaches of Ipanema and Copacabana, enjoy a Samba lesson in the lively Lapa district or just relax with a signature Brazilian Caipirinha cocktail in the sand. New Brazilian eVisas make planning your trip even easier. *Add-ons from other cities available upon request. Pricing as indicated valid October 16, 2018, based on two passengers travelling together. Subject to availability at time of booking. Blackout periods apply. For alternative dates, inquire for pricing. Itineraries are fully customizable. Brazilian Visa required for travellers from Canada and USA until June 17, 2019. Yellow Fever vaccination certificate may be required if entering other Latin American countries after you visit Brazil. **Airport and departure taxes are included, subject to change at any time. Optional tours and activities not included. Ongoing monitoring of the Zika virus continues around the world including Central, South America and the Caribbean. Please evaluate your risks before travelling. WINDSOR MARTINIQUE HOTEL, SUPERIOR ROOM The Windsor Maritinique Hotel is located just steps from Copacabana Beach, very close to Ipanema. With sophistication and elegance, this hotel is renowned for hospitality and for its excellent service with prepared and well-trained staff to warmly welcome you. The hotel is located in an area surrounded by some of the best bars, restaurants, attractions and sights of Rio de Janeiro. WINDSOR CALIFORNIA HOTEL Windsor California Hotel is Copacabana's newest gem. With Rio de Janeiro’s most famous beach at its feet, it offers hospitality and practicality to guests who have the privilege of standing before the most beautiful and famous postcards in the world. The Windsor California’s 157 rooms offer a cozy atmosphere and sophisticated decor. The hotel features a swimming pool with a panoramic view, fitness room and sauna. MIRAMAR HOTEL BY WINDSOR, SUPERIOR ROOM (Limited Ocean View) After The Miramar Hotel by Windsor is a stunning 5-star Boutique property located in the middle of the electrifying atmosphere of Copacabana Beach. 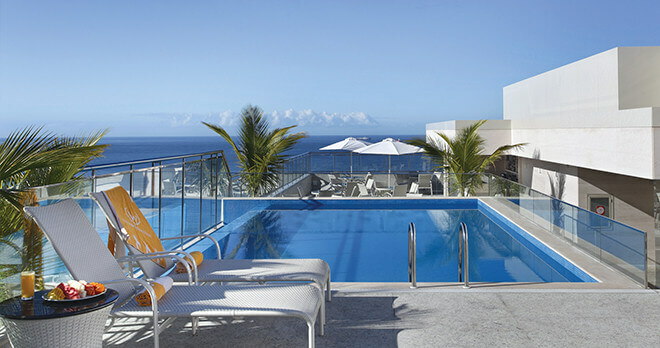 With Ipanema Beach only a few minutes away, the new Miramar is for demanding guests. Decorated with noble materials and unique fixtures, guests are greeted with a glass of champagne or fresh fruit juices upon check-in. BELMOND COPACABANA HOTEL, SUPERIOR CITY VIEW ROOM Since this glamourous landmark opened its Art Deco doors in 1923, the Belmond Copacabana Palace has been welcoming the rich and famous. 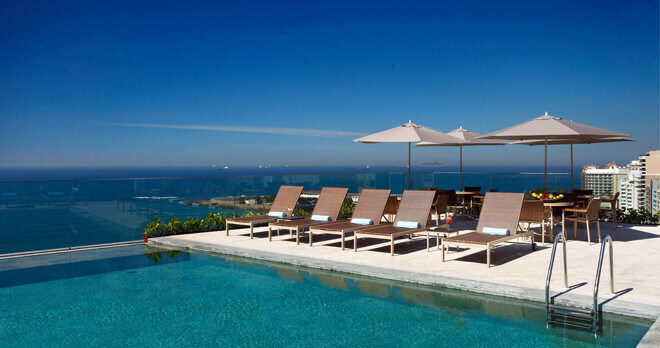 Superbly positioned overlooking Copacabana Beach, this is arguably the best place to stay in Rio. Soak up the sun in the magnificent pool or join Brazil’s style setters at the Piano Bar. Don’t miss the hotel’s top restaurants, whether for great local dishes or fine Italian dining at the Hotel Cipriani Restaurant. Visas required for entry into the country as necessary. Please discuss this with your travel agent to determine your requirements prior to departure. IMPORTANT: Brazilian Visa required for travellers from Canada and USA.